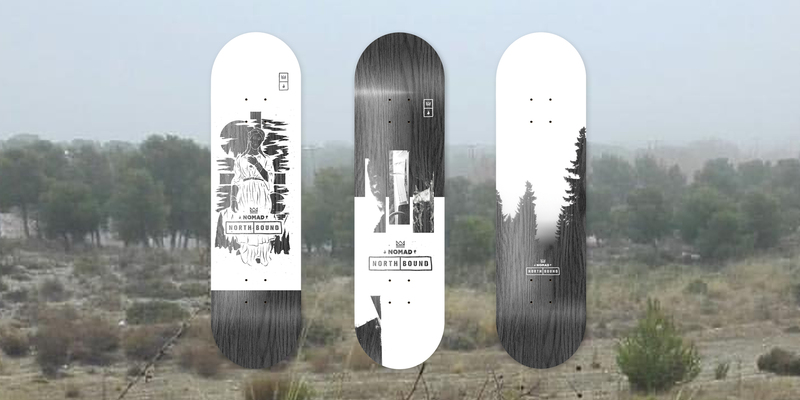 This fall and winter we have various new board series coming out from designers Maiky Maik, Lettercicas, and DeBeTe. Check out our FALL WINTER 2017 CATALOGUE HERE. We proudly present you this full part of CRISTIAN DELGADO! Cris is a ledge technician. He started his own wax brand “SPOTTERWAX”, named after the DIY skatepark which is practically his backyard. With this part you will see the real purpose of waxing ledges. Get ready for some heavy hitters! In March/April 2017 we went to Tenerife for a few days to hit the street spots besides the newly built skatepark in the capital Santa Cruz. 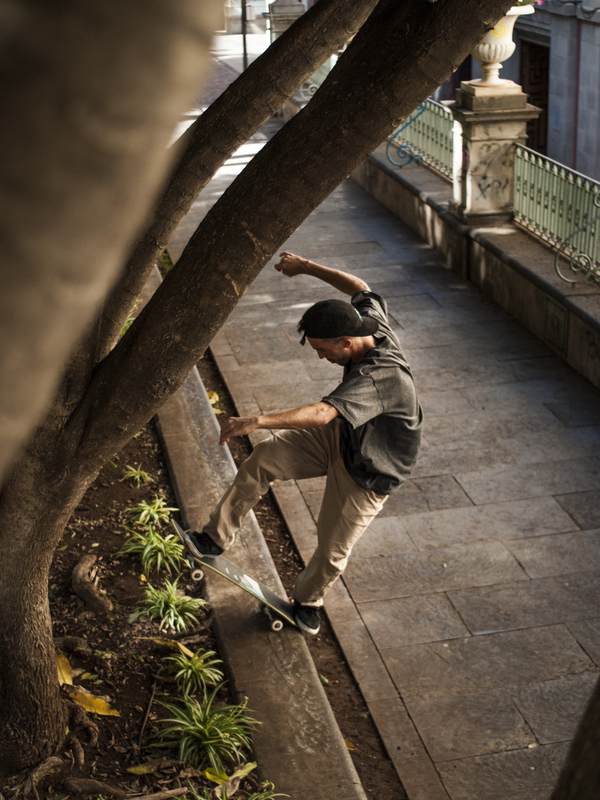 In 3,5 days the team skated and destroyed every spot in their path, as well as a little exploring through the Islands downhills through the rich natural reserves. Enjoy the show! 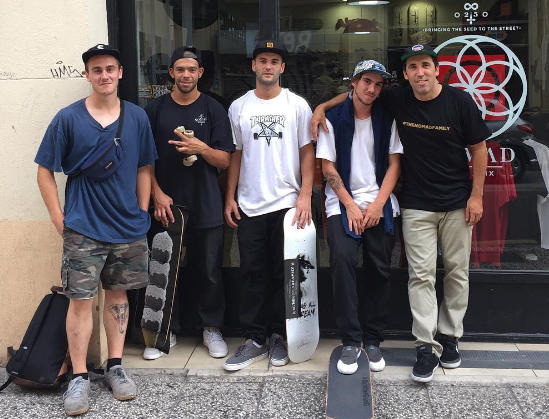 At the end of March we went with the team for a couple of days to Tenerife in the Canary Islands to visit our friends at AJ PROJECT Skateshop and to skate the spots on the island where it’s (almost) always nice weather. One afternoon we threw down a good session with all the locals in the recently built skateplaza “La Granja”. Thanks to Jose de la Rosa & Francisco José Alcoba Gonzalez for the hospitality. 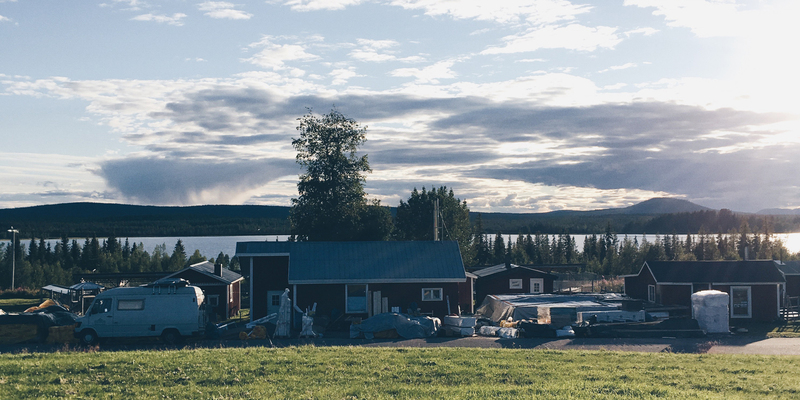 Last summer one of our good friends and designer Christophe Zedler (Member of KRID Kollektive) went on a journey up North, to spend a couple of weeks at WILDACT ADVENTURES in Arvidsjaur, Sweden. The fast and easy way to get from Switzerland to the north of Sweden would be taking a plane. 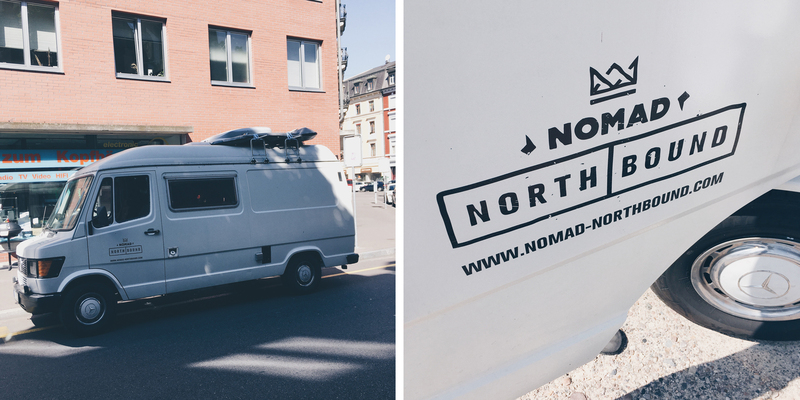 Chris wanted to make the adventure more special and came up with the idea to transform a van to a camper, and drive from his hometown Basel, Switzerland, up north. 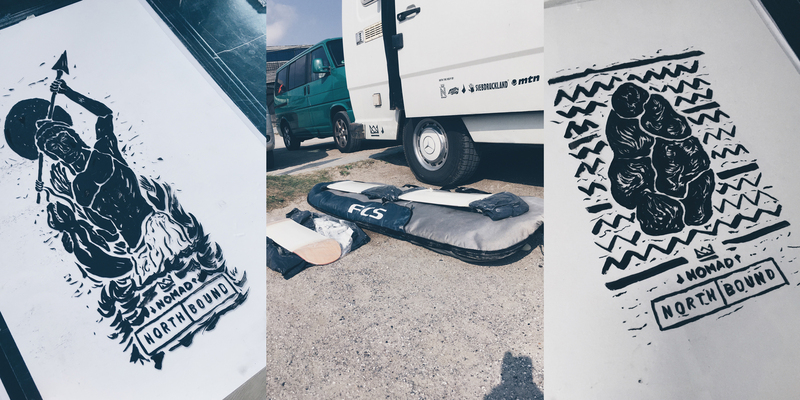 The van was also equipped with a mobile screen printing installation for boards and T-shirts, to be set to use at the numerous stops ‘en route’. 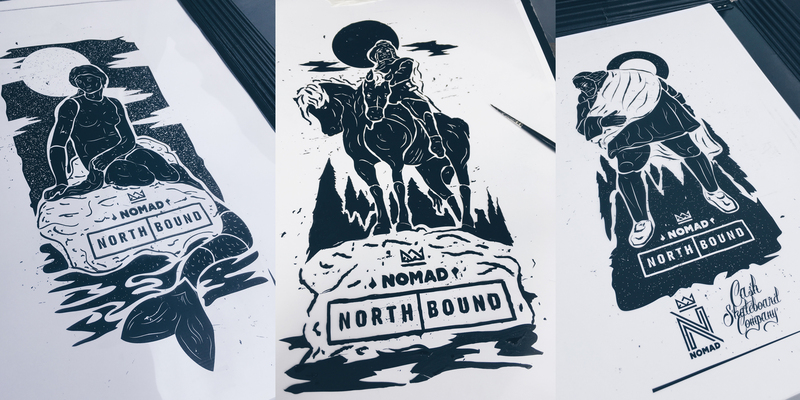 We joined forces with Chris by supporting him in preparing the journey and by providing materials for the printing, NOMAD x NORTHBOUND was born. Hi Chris, it’s been a couple months after getting back to Basel; did you need time to get used to ‘normal’ life again? Hola. Good point right at the beginning – the answer is just a plain: YES. I took some weeks to get back to normal working hours and a regular day rhythm. But since the journey’s impressions where still quite present it was not a big of a deal. Comparing Van life to life in a fixed flat, it was kind of overwhelming how much space u actually “claim” for yourself and your stuff. So almost straight after arriving I started thinking about what to get rid of and what to change in terms of living in a flat. Let’s go back to the beginning. Where did the idea come from to spend some time up north? The last years I spent usually my vacations at the French coast. I like the sea, but I also like forests and rough nature. I’ve been to Norway a while ago for a very short visit and I always wanted to see a bit more of this part of Europe. After Wildact Adventure tours was posting something on social media about that they are looking for helping hands, I thought that it could be a nice way to visit a much more Northern part of Europe than I have been to before. And to be honest: it was a good decision. You made various stops on the way before reaching Arvidsjaur, in Strasbourg, Trier, Bremen, Copenhagen, Norrköping, and Skelleftea. Which stop was your favorite and why? That’s a tough question. I enjoyed all of the stops. They all were quite different, but each one had something special to itself. Strasbourg was exciting because it was the first stop, so the material and setup needed to proof it. The stops in Copenhagen and Malmö I enjoyed the most. I guess because the weather conditions were the best, and it was easy to stay inside the cities with the camper and because of the amazing people I met. But actually I loved all the stops. On each stop you had a new design for the decks and shirts. Where did you find the inspiration and concepts? Usually I was trying get a bit of cultural background knowledge of the cities we stopped. Usually in Europe u find plenty of sculptures or medieval buildings for inspiration. Sometimes I got to know some funny stories about the cities by just walking around and talking with people who live there. The hardest one was Skelleftea actually. After I met a nice older guy who used to work on industrial ships all over the oceans it was clear to me what to do, he told me a bit of history about what used to be one of the biggest industries in the area. How was life in Arvidsjaur compared to Basel? What were the activities each day? I guess “wilder“ is the right word. Almost in every corner you could find the next adventure. It’s a small town and we stayed like 15 km outside of Arvidsjaur at Wildact’s Ranch. There u have plenty of nature. Everything is wide and open, with almost untouched earth; well at least it felt like that. Usually we had breakfast with the team of Wildact, we worked on building a new house or I was working on the screen printed postcards that created during my time there. 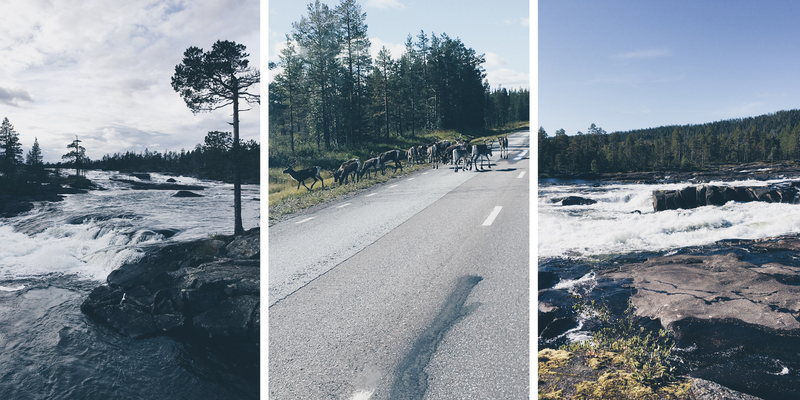 At the weekends it was time to see more of the incredible nature of Lapland and go for small trips. It was quite a nice time to recharge the batteries and learn a bit about living outside and how to use the tools given. Did you miss anything while staying there, or on the contrary what didn’t you miss? What I didn’t miss for sure were the loud streets, people yelling around and things one could call ‘urban hectic’. What I missed is actually hard to answer since everything was so impressive. Time…yes time was missing. I would have loved to stay some more weeks. The journey back south went quicker, with stops in Göteborg, Klitmöller and a visit to your family in Erfurt. Did you feel some sort of homesick at some point? I wouldn’t call it homesick, but for sure it was nice to come back. It’s always good to come home to meet your friends and family. I hadn’t been in Thuringia for a while and it turned out to be a good thing to spend some days in the area I grew up. I met up with friends that I hadn’t seen in years and we had a good time. The ride was a bit exhausting at the end. Maybe it was the German autobahn with the trucks overtaking me, since the van was not built for high speed chases. Before going on the journey you designed the products that are part of our Fall/Winter collection. Where did you get the inspiration for these designs? 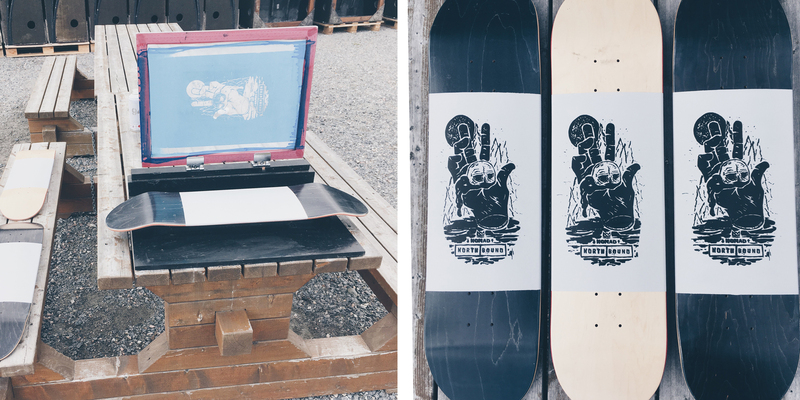 Usually I get quite inspired by NOMAD SKATEBOARDS itself. I love how you work with designers, artists and the team itself. Some products this time where inspired by the preparation for the journey. Spending a lot of time outside and developing a style that can be used for the whole project was a big influence. During that time I was also very much into creating structures influenced by nature, like trying to recreate tree bark with more urban tools or trying to find natural lining, patterns and shapes that could be used for creating new objects or artworks. Going Northbound is just one direction. In the future, do you plan similar trips to the South or East? 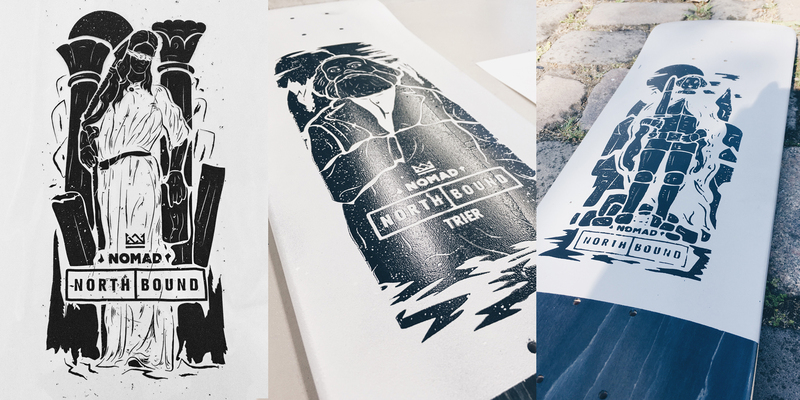 I would like to go on some more journeys with the screen printing concept for sure. To see new places, but also to develop more skills in screen printing and the whole developing process and other techniques. If you are up for it, let’s go! Thanks for your time! As always it’s a big pleasure to work with you. Do you wish to thank anyone? Yes for sure! 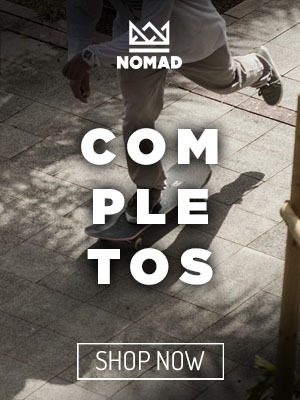 I thank NOMAD SKATEBOARDS for supporting the idea of the journey and making it happen, and of course for your trust. It wouldn’t have been the same without your help and coordination. Furthermore I thank Ashes Griptape for a full box of grip tapes, Siebdruckland for color and equipment support, Wildact Adventure Tours for the Hosting, Franziska and Johannes for a place to stay in the north, Max for having a great time in Copenhagen, my family for supporting, and everyone helping preparing the journey, following and coming out for the screen prints or a nice session. Follow Chris on his social media to stay tuned of his new work! Andres Diaz a.k.a. Niki is from Tenerife, Canary Islands and he rips! 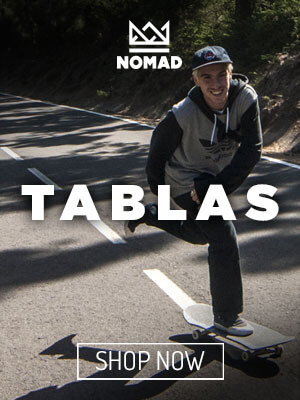 He was already representing NOMAD a few years ago, and now he’s back! His big smile and deep bag of tricks will show you why. 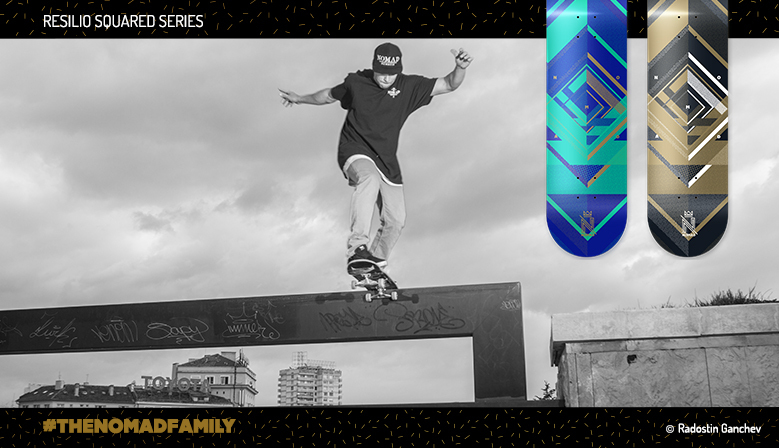 We proudly present the first full part to present the team riders: VLADIMIR IVANOV. Since 2014 we’re stoked to have Vladimir on the team, representing Nomad Skateboards with loads of motivation and killer tricks. Grab a drink, sit back, and enjoy the skating of Bulgarian’s finest. Film: Ivaylo Donchev, Martin Dechev & more. 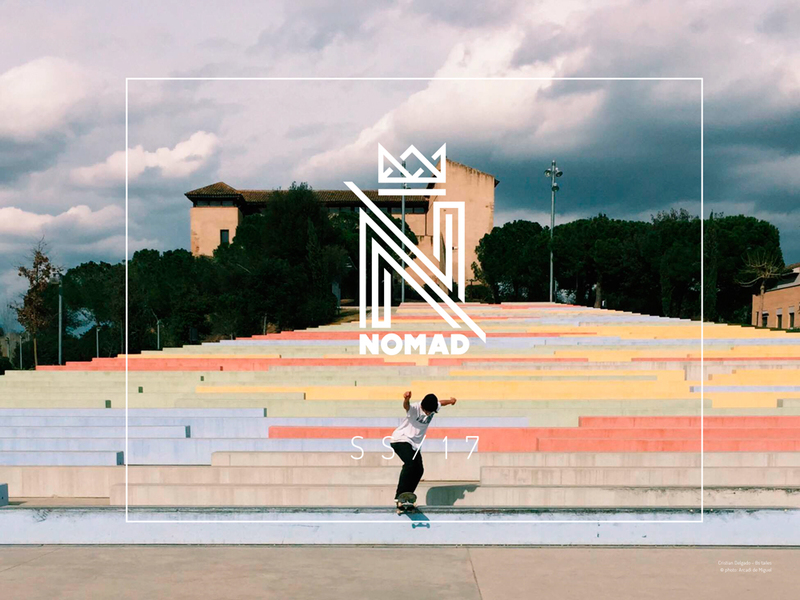 Vladimir Ivanov has been riding for us since 2014, and he’s super stoked to be a part of the Nomad Family. After the team meeting in July he stayed for another three weeks with us in Zaragoza to film for his upcoming video part. We got to know him as a mellow, relaxed guy who only gets pissed off when he does not land his tricks. He’s super dedicated to seek the limits of his skating, even with 45 degrees celcius he hit the streets to get clips. Full part + interview coming in October, check the teaser below! Left to right: Jorge de Torres (Zaragoza local), Vladimir Ivanov, Miguel Sanchez, Cristian Delgado, Jeffrey Luque. Last week we invited everyone to Zaragoza to spend a couple of days and to meet each other. These days were amazing, with lots of laughing and good skateboarding. Film: Mario Martin & Jeffrey Luque. With these guys we are sure that we’re going to have a great time for Nomad! Stay tuned for individual interviews, photos and more content very soon!